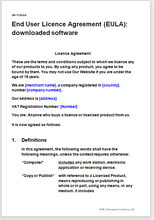 Here is your website T&C for a End user licence agreement, software, gizmos: download only; B2B and B2C; may be re-seller. The document does not try to describe what you actually do or offer for sale. That will be detail for you to make clear on your website. We have given you options in many areas, each in simple terms so that you can choose exactly what you want without having to put legal words together. Over 1,500 words of helpful and informative drafting notes.